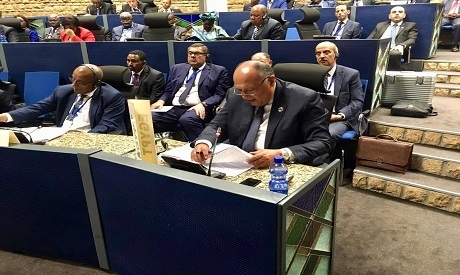 Egypt's Foreign Minister Sameh Shoukry said his country's 2019 chairmanship of the African Union underlined Cairo's close ties with African countries. Speaking to Extra News TV channel on Sunday, the minister hailed June 30 uprising and efforts exerted by the Egyptian people to preserve security, stability and economic progress. He described an AU decision to suspend Egypt's membership following the uprising as a "very sad moment". In just one year, Egypt succeeded in convincing the brothers in Africa that the country had witnessed a popular uprising that was seeking change in a clear democratic framework, Shoukry said. The minister reiterated that the 2019 chairmanship matches Egypt's political approach under President Abdel Fattah El Sisi to focus on the African continent. He explained that much attention was paid to Libya, whose situations have direct impact on Africa, in general, and neighboring countries, in particular, in terms of terrorism spread. Egypt seeks to bring about security and stability in Libya in cooperation with all parties, Shoukry stressed. Foreign Minister Sameh Shoukry said Egypt, Sudan and Ethiopia agreed to hold a meeting in Cairo on February 20, gathering their foreign and irrigation ministers, after negotiations have stalled for nine months. President Abdel Fattah El Sisi, his Sudanese counterpart Omar al Bashir and Ethiopian Prime Minister Abiy Ahmed reaffirmed the principles established in the March 15, 2015 Agreement of Principles, which stipulated that Egypt's water interests and Ethiopia's development rights will not be be harmed, Shoukry said. Any technical consultations should confirm and reinforce these principles, he added. The three parties did not come up with a unified vision on ways to deal with the issue of filling the dam, operating the reservoir and mechanism for verifying available water resources. All this issues are under in-depth technical studies, the minister said. Sometimes there are differences in vision and interpretation of these matters. Egypt proposed that this task be entrusted to a neutral body such as the World Bank or any other entity, he added. Shoukry affirmed that Egypt believes that this technical issues should not be politicized, stressing Cairo's determination to reach solutions that satisfy all parties. He hailed Egypt's close ties with Sudan and their coordination on the Ethiopian dam negotiations. Egypt was one of the first countries to sign the African Continental Free Trade Area agreement aiming to increase pan-African trade volume, the minister said. On the refugee crisis, Shoukry stressed the need to find appropriate mechanisms to curb the phenomenon. He pointed out that the main reasons for the crisis is the spread of conflicts in Africa, which caused the displacement of large numbers of people in African countries to escape the armed conflicts, economic deterioration, security conditions and the spread of terrorism. Solutions come only with a comprehensive vision of how to resolve these conflicts, Shoukry said. He added that development efforts can solve the crisis of displaced people on the African continent. The foreign minister voiced concern about the Turkish role in some African countries, especially Libya.